State Representative Paul Evans seems to have a problem following the law. In just four short years since his first election, he has broken state election laws over 100 times. 111 times, to be exact. It may be a record. It’s hard to find another legislator in Oregon’s history who has violated Oregon’s election law as often as he has. You might forgive Paul Evans once or twice, but not 111 times. If Paul Evans is this reckless with his reporting requirements, what else is he failing to do or comply with? If someone disregards the law this often, then they have lost our trust. It’s time for us to show politicians like Paul Evans the door. 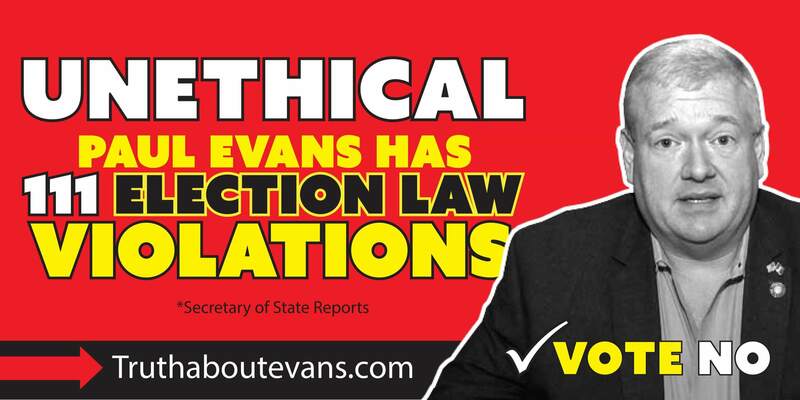 It is time for Paul Evans to publicly address his election law violations and apologize to his constituents..